The human eye has three color receptors. This is why 3D Color models are used in order to clearly identify colors and to compare these with other colors (see Color distance). 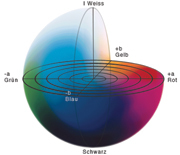 The most frequently used color spaces are the Lab color space and the RGB color space.